Last weekend saw me place a respectable 6th overall out of 36 players and Great Escape Games Sacramento contest of champions. I fought orks, space wolves and grey knights and won all my games tho some by greater margin than others. so I figured that I would give it another go! this Sunday I will be in redding for Norcon. my list and maybe some battle reports will follow but for now if you find yourself in northern California, swing by and say hello to the man in the pith helmet! My Death company chaplain challanges Mike O's Grand master at the CoC. 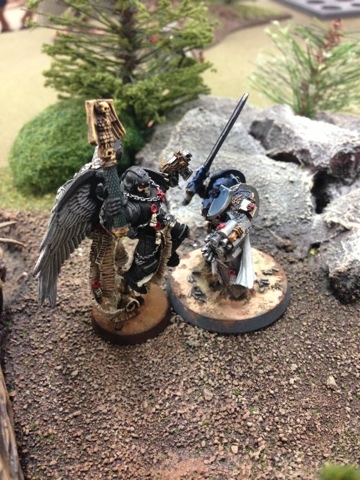 Even tho I won the game, this fight I didn't do well in as the grand master broke the poor chaplain across his knee leaving him broken and filled with feelings of inadequacy.